My partner and I went around the neighborhood and sowed some seeds into the planters. I’ve always been inspired by guerrilla gardening. Look up Ron Finley’s Gangsta Garden project to feel inspired yourself! He even has a TED talk about it. As we exist on the tipping point of destruction or saving our planet, each act as small as a seed being planted could make a big difference! How will we survive if things do collapse? By adapting, figuring out ways to DIY, growing edible landscapes and then knowing how to cook what was grown from scratch, networking into smaller communities, prevention of diseases through self care practices, etc. Collapse really could happen any time, a peculiar piece of evidence that I caught was a commercial on TV for 15 year supplies for a family of prepackaged meals in case of an emergency. To be responsible is to be prepared. To be prepared through the various mentioned ways would undoubtedly soften human’s load on the planet anyways and thereby reduce whatever consequences we would face if we didn’t start preparing now. This week we move into Spring, so it is time to practice growing some edible plants, especially those of you who think you can’t!!! Herbs are a good place to start. Lay some seeds down, connect to your community, bicycle instead of drive, and know that this is all part of our ahimsa practice towards the Earth and all of its current and future inhabitants. This is our karma yoga, to selflessly serve the earth and al it’s people, plants, animals, and insects, even when it’s not the most convenient for your self. PS. 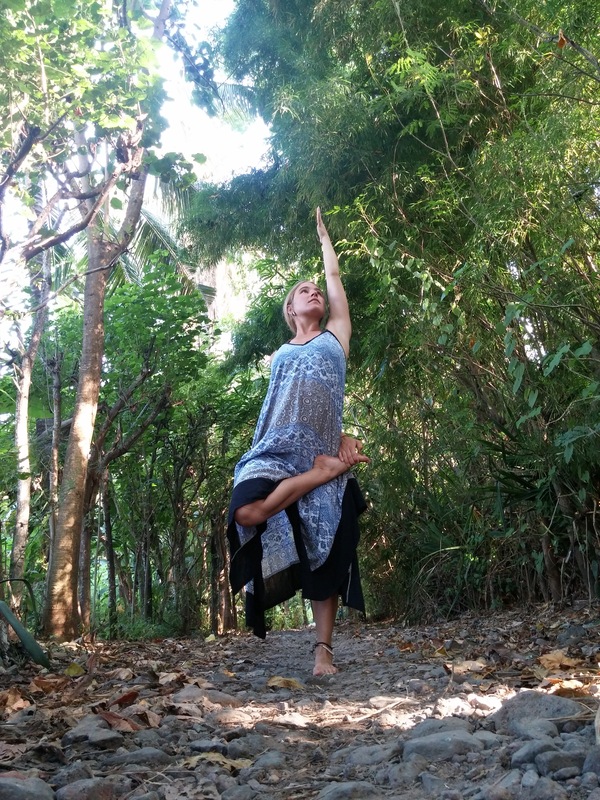 If you’re in Milwaukee, you can come to Eco Yoga Sunday’s at 10AM and know that 20% of total proceeds from your asana practice is donated to organizations that keep rainforests intact! Nestled in the southern coast of Borneo lies the Rimba Raya Orangutan Reserve. 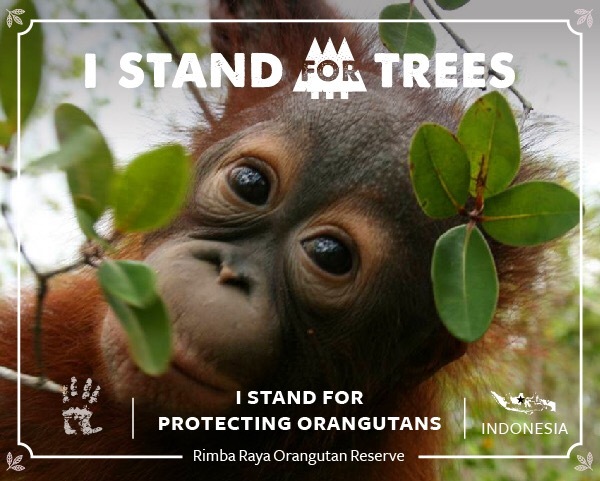 One of the most highly endangered ecosystems in the world, the High Conservation Value (HCV), lowland peat swamp forest is home to local communities and over 1,000 at-risk plant and animal species, including the Borneo orangutan, clouded leopard, and Asian sun bear. Everyday, paper and palm oil interests put Indonesian forests in jeopardy. If these forests are cut down, we run the risk of emitting one of the largest concentrations of natural carbon in the world. Show up to your practice at Eco Yoga and your practice benefits all of the beings that you share with the whole planet. Karma yoga is the connection to oneness or God by renouncing the fruits of our actions. The health of the planet, the purity of the air and water we thrive on effects our own health; one’s health depends on the health of Earth. We are not separate. Many swamis have said that the external world is a reflection of our internal world. How is the state of our environment reflecting what’s happening within us? We come to our sadhana to improve ourselves first and then it ripples out to effect our environment. 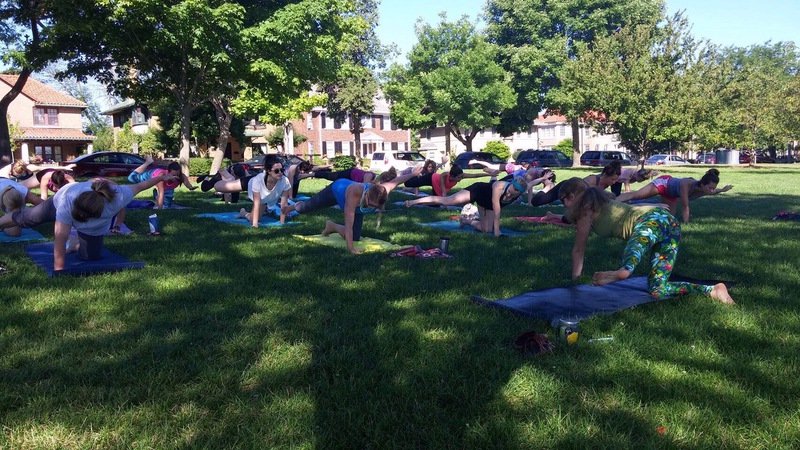 So for yoga teacher training on Earth Day, we engaged in some karma yoga, as pictured above: seed bombs. 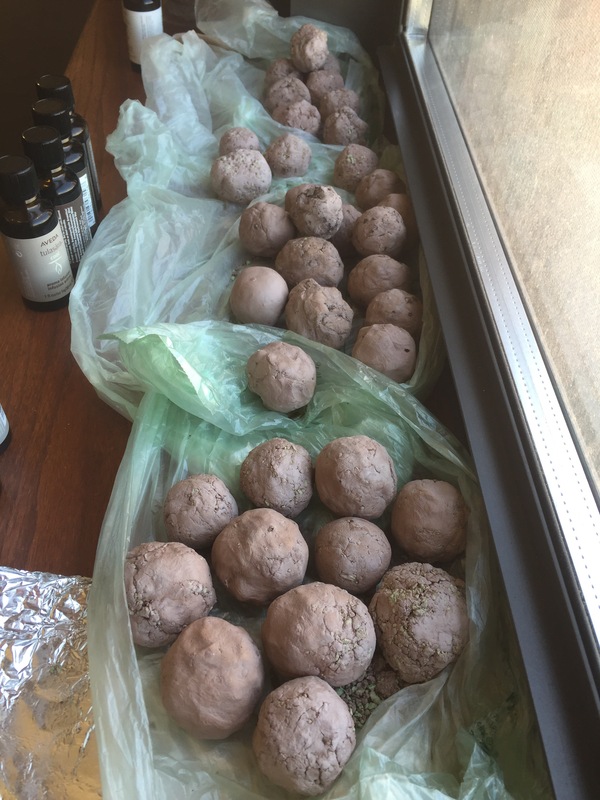 These are balls of clay and wildflower seeds to plant in neglected spaces. To make a seed bomb get some overworked clay from a local potter to recycle- it should be moist but not a slurry. Get your seeds, ones that can grow independently, and a little compost to give them some nutrients. It’s 3-5 parts clay to 1 part seeds, 1 part fine or sifted compost. Of course I don’t measure, so I recommend grabbing 1 inch diameter ball or hunk of clay, flatten, and then sprinkle your compost and seeds in the middle. Fold the clay around it, start to ball it and work it it becomes an even mixture and you might be able to add some more seeds in. If you mix in too much, the clay will crumble, so just split it into two and add a little more clay to each. Finally offer your seeds up to that which is Supreme. 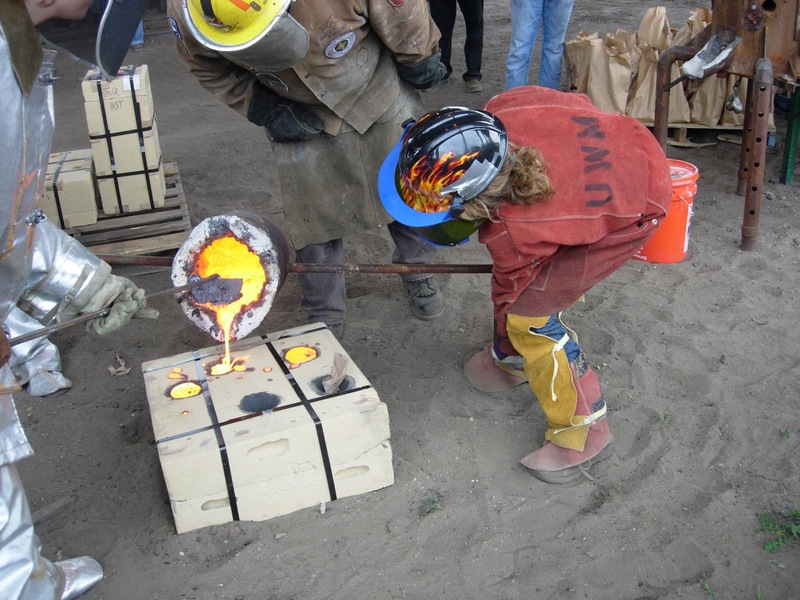 This is me pouring iron four years ago. I am an artist. I went to school for a bachelors of fine art, concentrating on jewelry, metalsmithing and printmaking. I am still an artist, only most people probably do not consider me one. My mission statement I declared as an artist was to improve the world. As I continued trying to bring awareness to my community by smithing objects and prints, I realized yoga to be the most effective medium. The most successful artists choose the best suited medium for their message and yoga delivers the message that my heart needs to share, the message of connection one has to all entities. Our purpose here is not to serve ourselves a cushy house with the luxury to vacation once or twice a year at the price of biodiversity of rainforests or the sea creatures, but to share the divine love that we’ve been gifted with all beings. My mission is to inspire thinking about others first before serving the self, to empower ourselves to take a step out of the center at this crucial time when our planet is at a tipping point leaning towards destruction.